This is second instalment of Build This Idea, where I write about stuff I want to exist. Treat it like an idea store; if you like something, take it; if you make it, let me know — I’ll be delighted to check it out. Today, a web service I think would be super neat but haven’t had the time to built yet. I would like a web service where I can easily enter any kind of meter reading, transit trips, plane flights, etc, and have it collate those over time and calculate and display usage and approximate carbon footprint. I was able to get this for electricity from a BC Hydro smart meter when I lived in Vancouver. But a lot of people, and a lot of data categories, don’t have smart meters. This would be the smart meter for everything else. 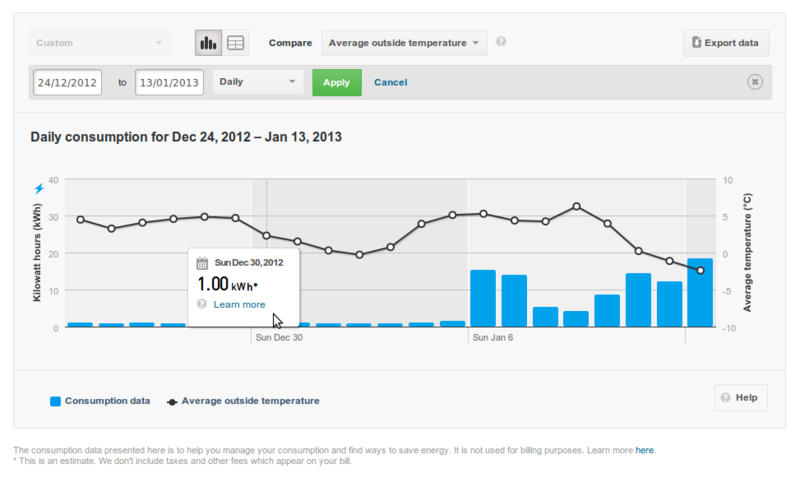 Have a simple interface with one field: the current meter reading. The user walks by the physical meter with their phone and enters the current reading in the browser. Three or five days later, do the same. With two data points, the site can calculate usage. With three data points, the service can display a trend. Draw a graph. Knowing the trend — and visualizing it — is perhaps the biggest thing. Nothing motivates quite like “you’ve used more this week than last week.” What can be measured can be improved, what can be tracked can be optimized, and what can be seen improving can motivate to improve more. Most people get some feedback when they get their bill. But feedback every two months isn’t as effective as feedback every three days. People can link what they did in the past three days easier than what they did in the last sixty days. You can change behaviour quicker. Frequent feedback can be done with a smart meter. Or it can be done with a service that will be a smart meter for the rest of us. The neat thing is that the solution can scale itself to so many things. Electricity meter. Gas meter. Water meter. A car’s odometer. Also point data: a flight from Heathrow to Pearson; number of transit trips in a month. I’ve created something like this for myself but updating it is substantially more involved than one input field. It doesn’t estimate environmental footprint (currently a 1000 km flight appears the same as a 10 km drive) and there’s quite a lot of technical debt. But it is a nice proof of concept and I did find that tracking motivates me to use less. Add ability to upload data from external sources, like CSV exports of BC Hydro smart meter data, or Oyster history exports. When presenting trends, add generalized data from the city/region/whole system for comparison, or add weather history to help people understand what might be driving their usage.